Hundreds of runners braved freezing temperatures to complete the Chichester 10k last weekend. Nearly 1,500 people ran the course at Goodwood with the first seven men and four women home beating the magic 30 minute mark. Will Mycroft was first over the line in 29.32, breaking the course record by 13 seconds, while Hampshire-based Steph Twell, who ran for GB at Rio 2016, broke the women’s record by six seconds in 33.17. There was success for the local runners, too, as nearly 50 runners from Bognor Tone Zone took part in the event, with nearly 10 personal bests chalked up on the way. First home for the club was Byron Kearns who took advantage of the quick conditions to finish in 37.20. Kari Mack was second home for the club in 38:39 and finishing fifth in her category while Danny Mahoney, Jess Thomson, Paul Jarvis and Juliet Stallard all finished below the 42 minute mark. One of the biggest personal bests of the day came from Kirstee Porter who took a massive 12 minutes off her previous best. 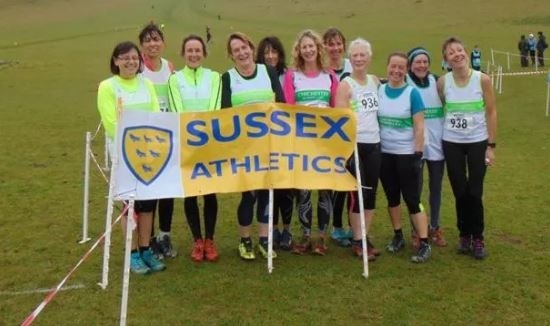 It’s been a busy week of running with more than 30 runners from Chichester Runners taking part in the Sussex Veteran Cross Country championships. Taking place at a new venue, Coombes Farm, near Lancing, the Chi contingent finished a commendable fourth club overall on the day. It was the ladies who took the medals with the over 55 trio of Jane Harrop, Helen Dean and Amanda Godfrey running holders Arena 80 close to win silver team honours. Harrop was the first one home, winning her over 55 category by nearly two minutes. The men’s combined over 50 and over 60 joint race saw no less than 17 Chichester runners line up in a good field of nearly 90. It was the over 60s who came closest to a medal led home by Richard Miles (4th). For the over 50s it was Jason Boswell who showed fine form to finish in 23rd place. The one disappointment team-wise was in the over 40s men when talisman James Baker pulled out with a back strain. It was left to John Peters to have his best run for the club in fifth place. That completed one of the club’s most successful Masters events in history.